Centrifugal pump is also called sand pump,GN Solids Control supply centrifugal pump from our China factory.Get centrifugal pump at Best price,Fast service. NOTE The path of the fluid is an increasing spiral from the inlet at the centre to the outlet, tangent to the impeller annulus. speed of the fluid in the annulus. Some of the motor power is expended as friction of the fluid in the casing and impeller. These centifugal pumps are developed and fabricated as supporting pumps based on requirement of transferring oil & gas drilling fluid. Centrifugal pump adopt the axial sucking structure and all the hydraulic components are wear proof cast iron, which is suitable for delivering the corrosive liquids with suspended particles in well drilling. 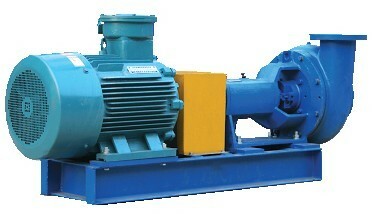 Its quality is accepted by Weatherford and assembling dimension is same to Mission centrifugal pump. Shaft seals are lubricated with grease and bearings are lubricated with machine oil and grease Since bearing covers at two ends of bearings are equipped with grease injectors. Both inlet flanges and outlet flanges for centrifugal pump are with two series standard dimensions. Centrifugal pump are widely used in oilfield drilling equipments and drilling mud equipments like shale shakers,desanders desilters etc.Top China Centrifugal Pump company for drilling mud,welcome to consult us for centrifugal pump for oilfield drilling projects.We supply centrifugal pump worldwide.